I am glad to be back after a three month sabbatical during which I had an extensive tour in the United States of America. I gave speeches in universities and colleges and to communities across America. I bring greetings from the country of Barack Obama Junior to the land of Barack Obama Senior. I thank the people of Kenya for turning out in such multitudes to welcome me and Ida back home. I will never forget this day. I thank Stephen Kalonzo Musyoka and Moses Masika Wetangula, Anyang’ Nyong’o and the entire CORD fraternity for their support and for leading our team so ably and ensuring that we remain united and intact. In the three months that I have been away, Kenyans daily communicated their frustrations to me via email, SMS and phone calls. A baby was shot in Mombasa and his mother killed, part of the growing victims of insecurity that has claimed young and old, babies and mothers. The cost of living soared. While we were away, billions of Kenya shillings were digitally and electronically transferred to agents of impunity before Kenyans could wink. And when we winked there were yet more claims of billions from us. Tourists left Kenya in droves. Hundreds of our people lost jobs thanks to growing insecurity and hopelessness. Devolution came under heavy attack. Governors live one day at a time and money is not flowing to the counties as required by law. While we were away, the State Law Office or the Attorney General’s Chambers ceased to host lawyers. It became the place for surgeons and morticians. To all Kenyans who spared their hard earned money to call, text or email me on the State of our Nation, I heard you. I thank you and I wish to respond to your petitions. We must take our country back from those who are ruining it for ALL Kenyans. On 27th August 2010 the Constitution of Kenya was promulgated. On that day we declared that all sovereign power belongs to the people and no temporal power or authority will ever again tower over or above the might of the people. The Constitution was never enacted as an instrument for the convenience and comforts of the state officers or elected representatives. It is you, the people, who have the power to determine the form of governance in this country. So today, on the eve of Madaraka Day, on this momentous day, we must rededicate and commit ourselves to the promises and ideals of our Constitution. To bring political reforms in Kenya was never easy. And to bring positive and decisive political transformation will be even harder. What is happening in Kenya today is not a true reflection of the ideals and promises of our Constitution. Unless we exercise our sovereign power as a people under the Constitution and take charge of the affairs of our nation today, hold our destiny in our hands and, take control of the duty to defend our Constitution, our miseries and tribulations will soar to unbearable proportions. So I repeat: we must take charge of the affairs of our nation today, hold our destiny in our hands and, together, take control of the duty to defend our Constitution. CORD believes in one Kenya, indivisible, proud and free, where each and all of us are our brother’s keepers. Nobody should feel excluded or suffer from the excruciating pains of negative ethnicity or any form of discrimination. We believe in the wealth of our diversity and the richness of our languages and cultures. You find CORD in every region and corner of the territorial length and breadth of Kenya and in all its territorial waters. 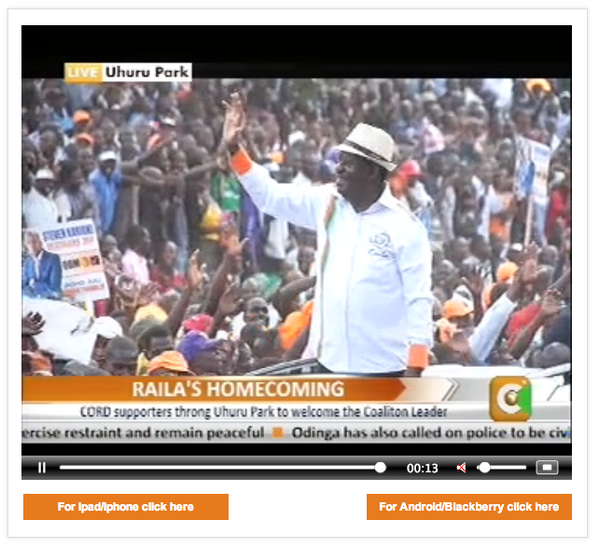 CORD is everywhere and is truly national. We in CORD know the value of nationhood, we have not learnt and will never learn the game of ethnic or racial exclusion or how to surrender to religious bigotry or to endeavour to create a kleptocracy. We believe that our fortitude will depend on how we take care of the weak, the minorities and the marginalised. Kenya detests and has no room for tribalism in all its adverse manifestations. Security has become the biggest problem in the country. Besides terrorism, which we condemn and abhor, the lives and property of all Kenyans are in danger. No spot is safe. The intelligence capability of the security sector has failed. The assets and equipment of the disciplined forces do not have sufficient upgrade. The causes of the security lapses would have been known if an objective analysis and lessons could have been drawn from the TJRC report. But it was discarded and demonized. The government declined to establish a judicial commission of inquiry into the circumstances surrounding and leading to the Westgate terror attack. And so, instead of undertaking the hard and disciplined fight against terrorists, our government has singled out an entire community to scapegoat and persecute. This MUST stop immediately. Under the Grand Coalition Government work started on a comprehensive blueprint to be approved and adopted as a national security policy with clear aims and objectives and a clear operational framework and structure. This too has been discarded. All we see is a cavalier incompetent and ad hoc challenge to terrorism and general insecurity. The security sector needs a complete overhaul. We stood with the nation when the Westgate Mall was hit and we shall continue to do so as CORD. But we believe our safety will never be guaranteed if the security sector is led by individuals who are more interested in their personal welfare and keeping their jobs, rather than in defending the country. The security of the country must be in the hands of the best men and women for the job. More than 10,000 jobs have been lost in the tourist industry alone. Everywhere ‘things are falling apart’. There are still no laptops. Many projects have stalled since the Grand Coalition Government’s tenure ended. Government has become one huge experiment without a cogent scientific formula or coherent policy. The economy is shrinking in real terms and the future is therefore bleak. The networks of corruption have become extremely active. We hear warning to the corrupt, but we see none sacked or arraigned in court. And as leaders milk this country dry to fatten their own bank accounts, prices soar out of the reach of ordinary Kenyans since money is being siphoned away from service delivery. We must stop this downward spiral not tomorrow but now! Otherwise there will be not future for ANYONE in Kenya. The Jubilee administration does not believe in Devolution. All the Governors say as much. The county governments are not getting an equitable share of national revenue. This year the County Governments have been short-changed by about Sh200 Billion in overall equitable share of revenue. Little effort has been made to ensure that the resources necessary for the performance of functions within the competence of county governments are provided or transferred. CORD will fight tooth and nail to protect the counties and county governments. I never really want to talk about the IEBC. If ever there was a doubt about the electoral fraud in the conduct of the last presidential elections, the facts are now out there for everyone to see and evaluate. There is no way there can be free and fair election conducted by the IEBC as currently constituted which can meet the constitutional test- impartial, neutral, efficient, accurate and accountable. This IEBC is busy fighting for its life in criminal courts; election courts and is under probe by both state organs and non-state actors. It must be retired. CORD bears no arms. We have no army. We will recruit no army to bring change to Kenya. We believe in Article 3(2) of the Constitution, which states “any attempt to establish a government otherwise than in compliance with the Constitution is unlawful”. I cite these provisions not that CORD needs to know, but it is the IEBC and Supreme Court which need to comprehend this fundamental constitutional tenet. Lest we forget, there was once a Constitution, which provided that there shall be only one political party in Kenya known as KANU. That the Constitution created an imperial presidency, which could dissolve Parliament at will and hire and fire judges of the High Court and the Attorney General. Without a bullet but with a ballot we repealed that bad Constitution. Who can be mightier than a people united in truth and justice? Who can be against us when the Almighty, Allah, is on our side? How can we fail when we are on the right side of history? Let’s not be faint hearted. Kenyans, arise and defend the motherland in pursuit of freedom and happiness. The time for change is today. The time is now. The train for change is leaving the station from here, in Uhuru Park where many campaigns have started, ended and succeeded. And therefore after extensive consultations with my brothers, Stephen Kalonzo Musyoka and Moses Masika Wetangula and the entire CORD fraternity, we have arrived at the first steps towards bringing healing and justice to our land, which I wish to propose to you for your approval. Kenya must hold a national dialogue at a convention consisting of all the major political coalitions represented in Parliament with the participation of representatives of civil society, religious denominations and workers organizations within the next sixty days from today. Preparatory talks should take place between the Jubilee Coalition and the CORD coalition to agree on the agenda and timetable for the national dialogue. The preparatory talks will also have the responsibility for dealing with the most immediate and compelling problems facing the country including high cost of living and insecurity. CORD will demand that the following be part of the overall agenda of the national agenda. 1. Cost of basic necessities. 2. Peace and security for the land and the review and reform of security organs. 3. Implementing and empowering devolution and those county governments get their equitable share of national revenue. 4. The electoral system and process and the overhaul of IEBC. NAIROBI, Kenya, May 31 – Deputy President William Ruto has said that no amount of noise from politicians will derail the Government in its bid to transform the Country. He says as much as political leaders have a right to advance their beliefs, they should avoid inciting people since the country was already on the move. Addressing residents of Narok West constituency where he opened five classrooms, the Deputy President said the Jubilee administration will only focus on developing the country. “We will respect and protect their right to say what they want to say but they must know that while they have their say, we have our way – to ensure we transform the country,” he stated. Ruto said that time for politics of mass action, demonstrations that divide Kenyans along tribal lines was over, adding that leaders should instead spend their energy on nation building. He said so far the government has laid foundation to its development agenda and not even protests can change the facts. The Deputy President cited several projects being undertaken by the government as testimony of its pledge to serve Kenyans, adding that the Jubilee administration was confident it will deliver on its scorecard. “We said that we will construct a Standard Gauge Railway line and the project has already started,” he pointed out. Ruto said that since independence, a total of 14,000 kilometres road network has been built in the country but the Jubilee has plans to construct 10,000 kilometres in five years. On electricity, he pointed out that a record breaking 400,000 homesteads have been connected to the national grid in the past one year adding that the government is making plans to reduce the cost of electricity in the country. The Deputy President also noted that County Commissioners have their work cut out to enhance service delivery at the grassroots by ensuring national government employees remain accountable. “County commissioners will ensure that national government employees are accountable and deliver on the national agenda in line with the constitution to enable the country move forward,” he said. Leaders from Narok County who accompanied the DP asked Kenyans to shun those bent on dividing the country to gain cheap political mileage. An emergency dispatcher who made disparaging remarks about Oprah Winfrey during the Maya Angelou 911 call has been suspended. An emergency dispatcher who made disparaging remarks about Oprah Winfrey during the Maya Angelou 911 call has been suspended, ET has learned. EMS Director Dan Ozimek gave a statement to ET, saying, "These comments are unacceptable and we have opened an internal investigation to look into the circumstances surrounding this event." John Ruckh was heard on the 911 tape saying that Oprah, a friend of Angelou's had "fallen out of grace" after a controversial interview in which Oprah expressed her thoughts about race in America. "Unfortunately, I work in a high-profile job and everything's recorded," Ruckh told the Winston-Salem Journal. "This is in no way a racial slur, slander, associated conversation ... 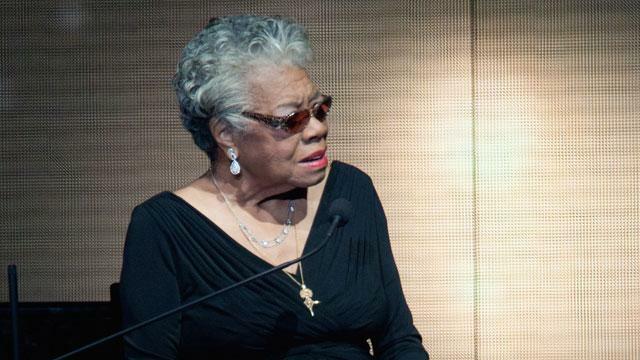 I really hate that this happened at the time that it did, because this is taking away from Maya Angelou's passing." Dr. Angelou died at her home in Winston-Salem, North Carolina on Wednesday at age 86. She was born on April 4, 1928 in St. Louis and in the 1960s served as the northern coordinator for the Southern Christian Leadership Conference. She also worked alongside Dr. Martin Luther King, Jr. and Malcom X. Among her achievements, she received the Presidential Medal of Freedom in 2011 and the Lincoln Medal in 2008. After Angelou's passing, Oprah gave this statement to ET: "I've been blessed to have Maya Angelou as my mentor, mother/sister, and friend since my twenties. She was there for me always, guiding me through some of the most important years of my life. The world knows her as a poet but at the heart of her, she was a teacher. 'When you learn, teach. When you get, give,' is one of my best lessons from her. But what stands out to me most about Maya Angelou is not what she has done or written or spoken, it's how she lived her life. She moved through the world with unshakeable calm, confidence and a fierce grace. I loved her and I know she loved me. I will profoundly miss her. She will always be the rainbow in my clouds." MIAMI – The only thing more intimidating than LeBron James in control is LeBron James in a controlled fury. The best player in basketball responded to the Indiana Pacers' resident housefly, Lance Stephenson, with an emphatic swat on Friday, racing his Miami Heat past Indiana with anunsightly 117-92 stomping to finish the Eastern Conference finals in six games. James greeted Stephenson in the first quarter of the win with a hand to the face, an elbow to the shoulder and a shoulder to the jaw on his way to the rim. He followed that with his lethal array of soft jumpers and touch passes, even rejecting a George Hill layup in a highlight that cemented the game before 9:30 p.m. local time. When Stephenson, who infamously blew into James' ear in Game 5, put his palm on James' beard in the first quarter, the four-time MVP stood up, faced his foil, and said, "Hey, yo, you touch my face one more time …." Stephenson would get out of James' face and the dysfunctional Pacers are now out of Miami's way. James and his teammates are back in the NBA Finals for a fourth straight time – a feat rarely done in professional sports. The Big Three – James, Dwyane Wade and Chris Bosh – are unbeaten in clinching games at home since they arrived here. What makes the team even more fearsome is that it's peaking now – throttling higher on its blend of execution and emotion, and just plain throttling opponents. This is a machine now, and it is accelerating. "We know we can impose our will," Wade said. "A few years ago, we were unsure." The Heat's Game 5 loss in Indianapolis was aggravating to the two-time defending NBA champions. "We had a very angry group yesterday when we met for practice," said head coach Erik Spoelstra. Shane Battier seconded it: "We were as focused as I've seen in a long time." The focus stayed, even when Stephenson started "being himself," in the words of Norris Cole, who got a slap to the face from the Pacers' irritant, resulting in a flagrant foul for Stephenson. Cole went down to the court for several minutes and it looked like the game would devolve into a brawl, but James wouldn't have any chaos. When Udonis Haslem started jawing at Stephenson, going so far as to threaten him from the bench, James restrained his longtime teammate, pushing him back and getting in between Haslem and Stephenson. James later said the slap was "uncalled for," but explained, "I guess I know what the bigger picture is." James has indeed learned what the bigger picture is. He is the bigger picture. Later in the game, James got in Cole's face and reminded him, "We have another round." It felt like the entire capacity crowd here wanted to take a swing at Stephenson, but James redirected all the energy into the building into irrepressible basketball. It was remarkable to see the Heat grow in the moment while the Pacers wilted. The destruction was clear in the Pacers' locker room after the game. Stephenson said he didn't remember the face wash of James or what was said. He insisted he didn't intend to hit Cole in the face even though, "I know it looked bad." He said he had no regrets – three times, in fact. In the other corner of the room, Roy Hibbert sat crumpled in a folding chair, his shoulders curved forward and his head down. He looked both despondent and dilapidated. Asked if it's getting more difficult to beat the Heat with every passing year, he could say only, "They're a good team. They execute." In his postgame news conference, Paul George – who was as absent in Game 6 as he was omnipresent in Game 5 – said, "I don't know" when asked if he wanted Stephenson back on his team. His comments, when taken in the full context of his reply, aren't nearly as harsh as they seem. But it's another example of a team that can't figure out what to say together, let alone how to play together. 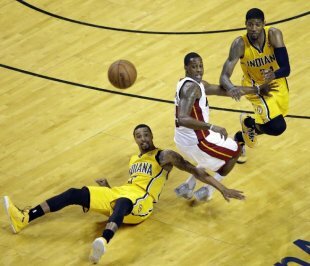 The Pacers' dissolution makes the Heat's resilience more impressive. Miami's players have held fast in a city of distractions and a league of distractions. 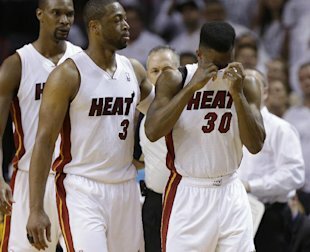 There are three huge photos of Heat players beyond the team's locker room door, and two of them – one of Wade and one of Haslem – prominently feature rivulets of blood. The gashes end up making the opponent weaker. "We wanted to win this very badly," Battier said. "Very badly. For multiple reasons." Battier said that was clear in the minutes before the game began. Nothing was said in the locker room. "Didn't need to," he said. It was Battier of all people who came the closest to retaliating verbally for all the obnoxiousness the Pacers slung throughout the series. He said he was looking forward to the team's Finals opponent, whether San Antonio or Oklahoma City, being "about basketball" rather than "the chicanery we faced." You know how to gauge the Heat's maturity when the angriest postgame word uttered is "chicanery." The Heat players are beyond pettiness. They're beyond the Pacers. They're simply beyond. They are bound for their fourth straight Finals, and although James spreads credit like he spreads the ball around, he is the emotional engine – hot but never overheated. "He's always the most intense when the moment is biggest," Cole said. "That's what he does." James can't be slowed with "chicanery." He can't be slowed with strategy. It's uncertain whether his controlled fury can be slowed at all. What else could Ballmer buy with $2 billion? Not long after the TMZ audio leak that made Los Angeles Clippers owner Donald Sterling an instant pariah, it became clear he was unlikely to hold onto the NBA team for long. The question then was not so much “who wants to buy the L.A. Clippers?” as “who doesn’t?” Folks including Magic Johnson, Larry Ellison, Oprah Winfrey, David Geffen, Matt Damon and even Frankie Muniz expressed interest in releasing the team from the clutches of an owner perceived by many as a repugnant racist. Now, former Microsoft (MSFT) CEO Steve Ballmer has come out ahead in the bidding war with a cool $2 billion offer for a team that, just this past January, was valued at only $575 million by Forbes. Ballmer, known as a bit of a big spender during his tenure at Microsoft (recall that $8.5 billion Skype buy? ), is an avid basketball fan who can well afford this purchase; his net worth is a reported $20 billion, largely due to his Microsoft holdings. And while we’ve seen business deals just this week that are worth more, $2 billion is a record price tag for an NBA team. As an entertaining exercise, Yahoo Finance looked into some of the other purchases that could be made for this price or less, with an eye toward Ballmer and his specific likes (he’s a golf lover, and has been known to hold many business meetings at a favorite Washington steakhouse). Items tallied are equal to or just a bit less than $2 billion; it's worth noting that, after buying Del Frisco's (DFRG) and BJ's (BJRI) at their current market cap totals, Ballmer would have enough cash left over to purchase approximately 167,785,234 10 oz bottles of Lea & Perrin's Worcestershire sauce.